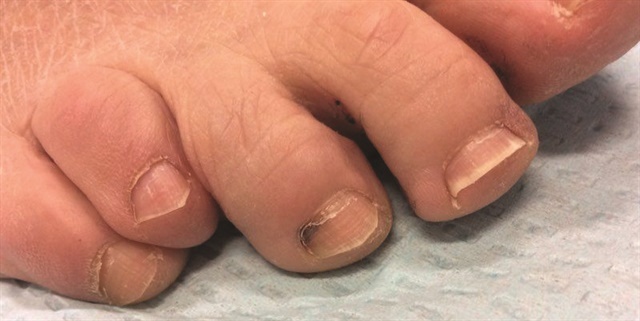 In this month’s column, Dr. Stern discusses subungual hematoma, an accumulation of blood under the nail plate resulting from trauma to the fingers or toes. Subungual hematoma occurs when the nail bed is injured by either blunt or sharp trauma to the fingers or toes. The nail bed has a rich supply of blood vessels that when injured can cause blood to accumulate under the attached nail plate. This increased volume and resultant pressure will often cause the nail plate to lift and separate off of the nail bed. Significant discomfort may ensue. The nail with subungual hematoma will initially appear purple to copper to blue and over time may take on a more brown/black appearance. Several scenarios can result in subungual hematoma. Injuries can be classic acute crush-type injuries, such as getting your finger stuck in a door, or conversely the injury may have a more subtle and less traumatic cause, such as a poorly fitting shoe. Certain athletic activities can also predispose a person to hematomas; tennis, running, hiking, and skiing are all common culprits because the toe is often forced into the tip of the shoe during the athletic movement. Those who take blood thinners are also at increased risk for subungual hematomas. If the injury has occurred within the past 36 hours, a physician may need to intervene, depending on the type and degree of the injury. The generally accepted rule is that if the hematoma takes up 50% or more of the nail’s surface area then it’s advisable to relieve the pressure by creating an opening in the nail plate. This procedure, referred to as trephination, can be done sterilely by a physician. Alternatively, if the patient doesn’t have access to a physician, in a pinch the nail can be trephinated using a hot paperclip. Creating an opening in the nail relieves the buildup of pressure and ultimately prevents the nail from lifting off of the bed. This maneuver will also dramatically improve the discomfort associated with a nail that is detaching from the bed. If the finger or toe was damaged due to a crush injury then an X-ray may be needed as well, and depending on the type of trauma, the nail plate may need to be partially removed in order to assess for nail bed cuts that require suture. Nail technicians observe subungual hematomas on a daily basis in the salon. Most of the time these findings are from old injuries and are commonplace and not of grave concern. However, the distinction between subungual hematoma and nail melanoma, which can look similar, is a crucial one. Melanoma is a type of cancer that most people tend to associate with the skin. However, it can arise in the nail unit as well. Melanoma occurs when the pigment-producing cells in the nail (melanocytes) begin to grow in an uncontrolled fashion. Although melanoma in the nail usually first appears as a single pigmented brown or black band, most pigmented bands in the nail are actually benign or non-worrisome. More advanced melanomas can appear more smudge-like and irregular with dark brown to black pigment on the nail and often on the surrounding nail fold. Nail melanoma usually occurs in a nail that has previously experienced trauma. Therefore if you see a nail that has dark, ill-defined pigment that is not growing out, consider the possibility that it may be more than just blood under the nail. [See sidebar for what to do if you suspect a client has a nail melanoma.] Keep in mind, however, that nails grow slowly and a subungual hematoma will take a long time to grow out. For example, if the hemorrhage is on the big toe at the half moon area it may take over a year for the pigment to grow out completely. Fingernails, in contrast, are much faster growing. The buildup of blood under the nail will often cause part of the nail to separate from the nail bed. When the injured nail is separated (onycholysis) certain precautions should be followed in order to optimally achieve re-adhesion of the nail plate to the nail bed. Keep the nail clipped short. Do not file, as filing will cause further separation. Avoid nail cosmetics during the treatment period, especially polish remover. Polish remover is a strong solvent and will cause significant irritation to the exposed nail bed. Recommend that your client keep the nail clean and dry, and avoid soaking it in water or other liquids. Gloves are advised for any wet work. If the nail is significantly separated it may require treatment with an anti-yeast topical agent prescribed by a doctor. Can subungual hematomas be prevented? In many circumstances the answer is yes. If the injury is caused by athletic activity, then it is advisable to assess whether the footwear is properly fitting. Many adults don’t realize that their feet change with age and often their shoe size is not what they think it is. Someone especially prone to toenail trauma with certain activities should consider wearing a silicone toe protector (available online). Runners may benefit from wearing a sock with extra padding at the toe. Keep the toenails clipped short. Those who take blood thinners may want to consider several of these precautions because they are especially prone to hematoma. Refer to a dermatologist. It is always a good idea to have a local dermatologist’s card readily available in your salon. Do not cover or mask the abnormal nail with an enhancement or polish. This can result in a delay in diagnosis. When in doubt, discuss your concerns openly with your client. You can keep a copy of this article with the photos to compare and show your client. As a nail technician, you are not expected to be an expert in pigmented lesions, but there are certain red flags that should alert you to refer your client to a dermatologist. 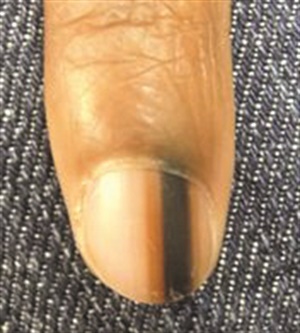 A single pigmented band that is brown or black on a single nail. There is brown pigment on the surrounding skin (around the nail). The band is on the thumb, index finger, or great toenail (the most common digits to have melanoma). The pigment is taking too long to grow out and appears to be growing larger. Dermatologists treat skin, hair, and nails. I am a board-certified dermatologist and I specialize in the treatment of nail disorders including nail infections, inflammatory diseases of the nail, cosmetic issues related to the nail, cancers of the nail, and sports-related nail injuries. I also perform surgery on the nail including biopsies and excisions. 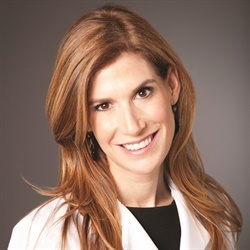 Read previous “day in the life” articles by Dr. Stern at www.nailsmag.com/danastern. You can contact Dr. Stern with your questions via Facebook (www.facebook.com/danasternmd) or Twitter (@DrDanaStern). Visit her at www.drdanastern.com and www.drdanabeauty.com.